The California Family Law Property Declaration and Distribution Calculator allows you to easily enter all property – community or separate – and all known community and separate assets and debts for your client's case. The calculator simplifies the entry of transactions, dramatically reducing the time it takes to handle family law matters. 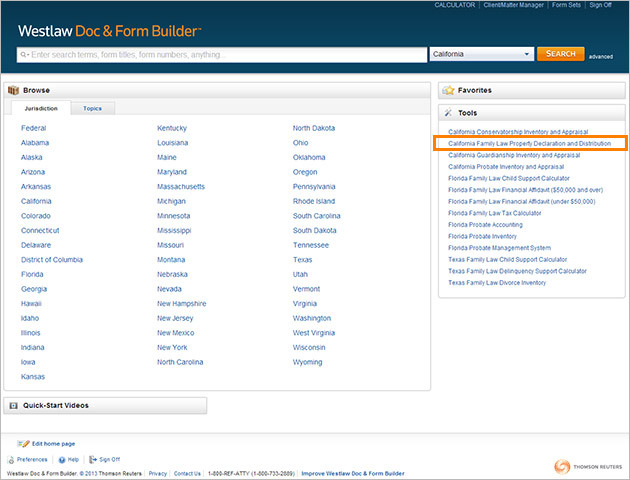 For California practitioners, this calculator is another way Form Builder helps streamline document assembly. 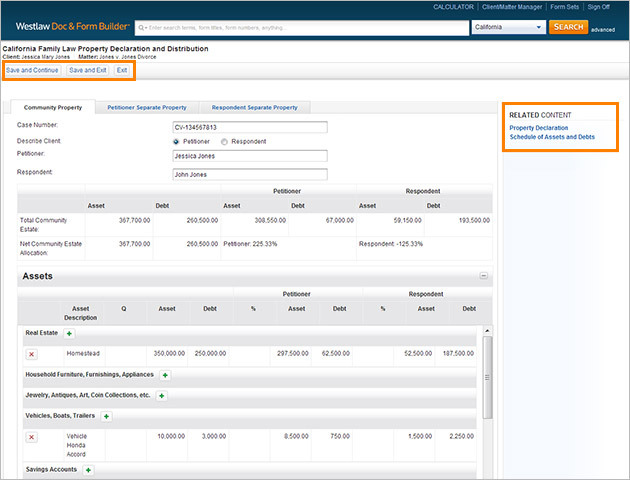 You will find the California Family Law Property Declaration and Distribution Calculator under the Tools box on the Form Builder homepage. 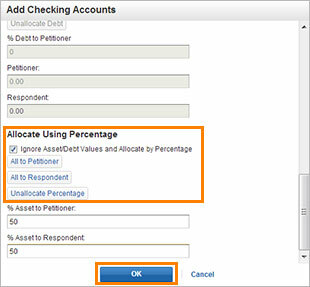 Before you can begin entering assets and debts you must either select a current Client and Matter or use the green plus icon (+) to create a New Client and New Matter. 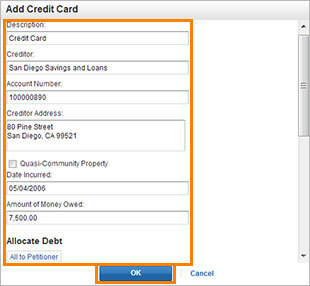 Begin filling in the Community Property tab by entering the case number, selecting your client with the button, and entering the party names. Notice the section below lists the total community estate and net community estate allocations for both petitioner and respondent. 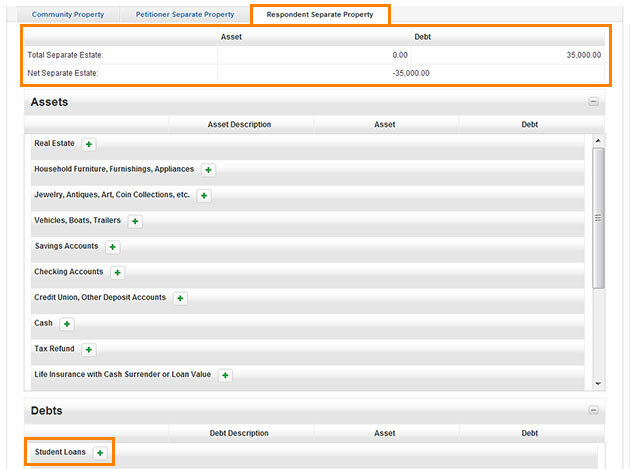 To begin entering assets, simply navigate to the type of asset you wish to add (e.g., real estate) and click the green plus icon (+). Enter a description of the real estate, the date it was acquired, address, the gross fair market value, and any debt against this asset. Note: Click the box next to Quasi-Community Property if this is a quasi-community asset. 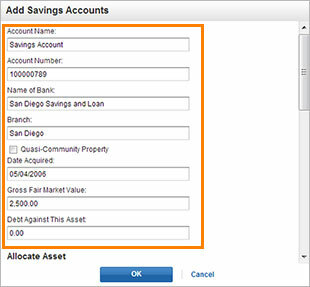 Continue adding assets by navigating to the Savings Accounts category. Click the green plus icon (+) to add an entry. Enter the applicable information for account name, account number, name of bank, branch, date acquired, gross fair market value, debt against this asset, and allocate asset or debt to the appropriate party. Click OK when finished. 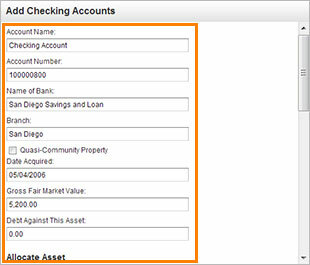 Next, click to add an asset under the Checking Accounts category. Fill out the appropriate information. 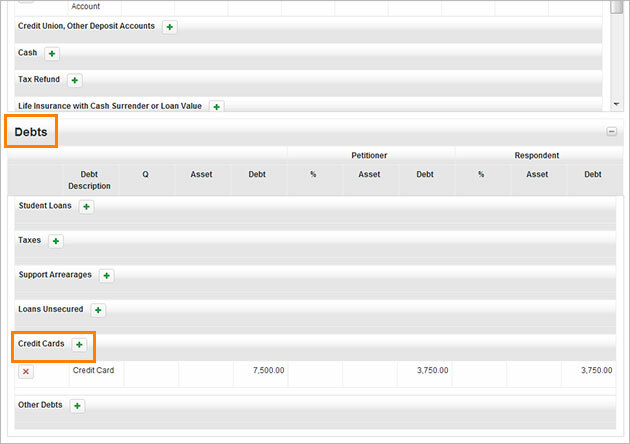 You have the option to allocate assets to a party or ignore asset/debt values and allocate by percentage. Click OK when finished. 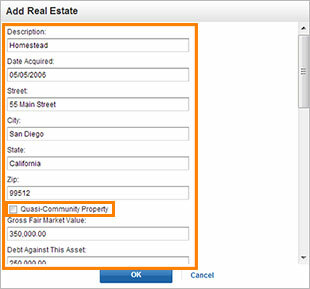 Once you have entered all Community Property assets, scroll down to enter the appropriate community property debts. Click the green plus icon (+) to add credit card debt. Fill in the appropriate information for description, creditor, account number, creditor address, date incurred, and amount of money owed. If you scroll down, you will see the same options of allocating all debt to a particular party or you may enter a percentage or dollar amount you wish to allocate. Click OK when finished. Once you have finished entering assets and debts that are Community Property, navigate to the next tab to enter Petitioner's Separate Property. 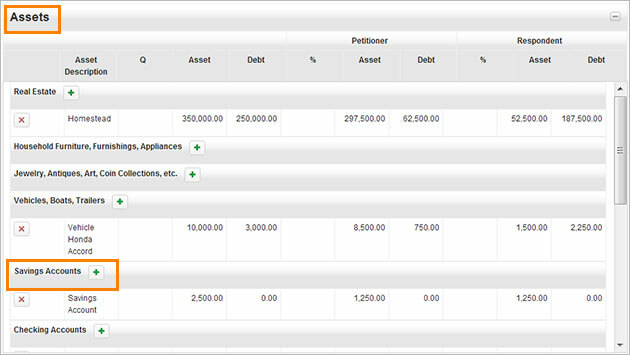 The tab for Petitioner Separate Property will also list total and net amounts for petitioner's assets and debts at the top of the page. 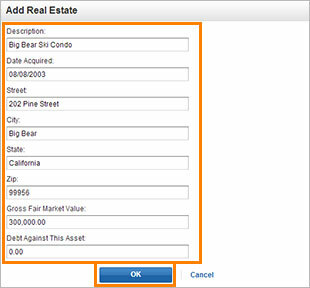 To add a real estate asset click the green plus icon (+) and enter the appropriate information: description, date acquired, address, gross fair market value, and debt against this asset. Click OK when finished. Note: To edit an existing entry, click the asset or debt you wish to change, make the appropriate change, and click OK. To delete an entry, simply click the red X. 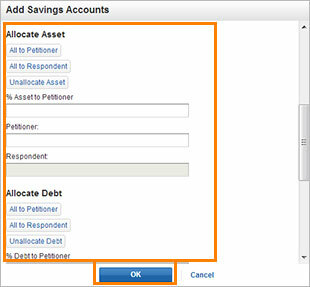 Once you have finished entering assets and debts that are Petitioner's Separate Property, navigate to the next tab to enter Respondent Separate Property. Total and net amounts will also be listed for respondent's separate property at the top. To add student loans for the respondent, click the green plus icon (+) to enter any debts. Fill in the appropriate information for description, date incurred, and amount of money owed. Click OK when finished. Once you have entered all community and separate property you can access both the Judicial Council Form FL-160 Property Declaration and the Judicial Council Form FL-142 Schedule of Assets and Debts on the right-hand side under Related Content. 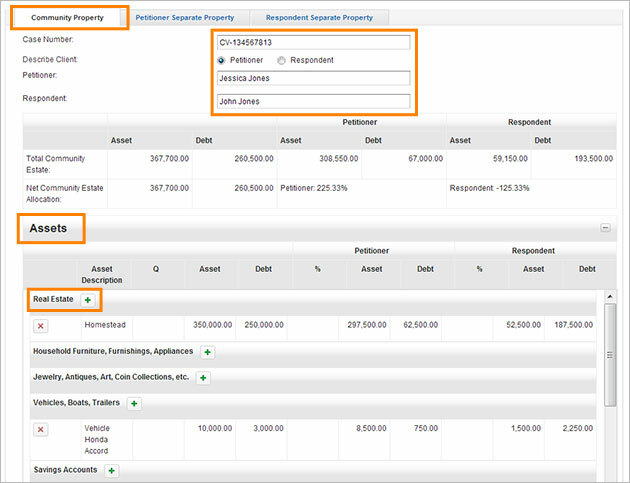 Since all of the asset and debt information you have entered is saved under your client and matter, this data will auto-populate into both of these forms, making completion quick and seamless.